This is going to be a very brisk LWOM post (what’s LWOM?). Why yes, because there’s the White Rabbit! And we must catch up with him. “No time to talk, no time to chat, I’m late and later, and that is THAT!” shouted the White Rabbit as he jabbed and poked at his oversized pocketwatch. “RUN!” the Rabbit yelled. And so we ran. Into the sunset, to be precise. 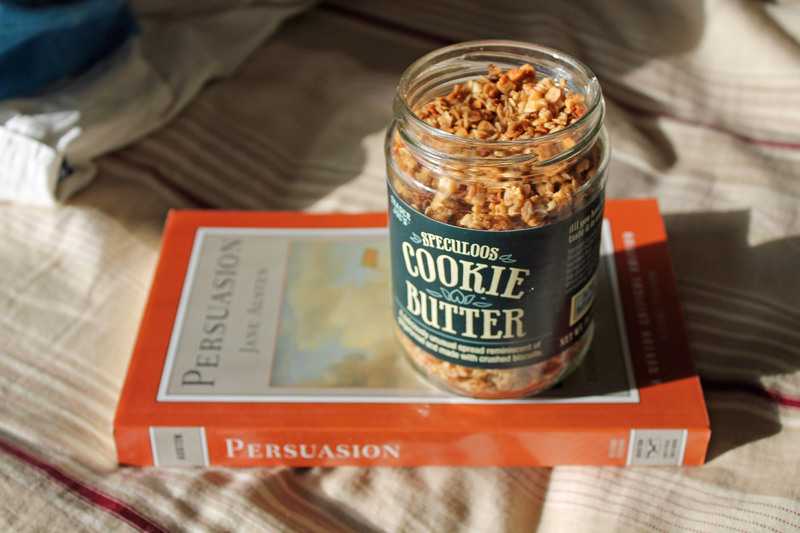 On my kitchen table: Persuasion, by Jane Austen, and a jar of the best crunchy cinnamon granola in the world. So that’s why this post is so short. Because the White Rabbit was late, and because I myself was running late after an extended trip to the gym and forgot all about my outdoor food photoshoot and had to take some hasty pictures while the sun was sinking down past the horizon in about 0.5 seconds. And also because I’m (hopefully) going to Disneyland in about half an hour to see the White Rabbit in person–er, in rabbit. Yes, I’m grinning as I type this. “But that doesn’t mean that this isn’t the BEST granola in the world,” said the White Rabbit, who had suddenly appeared from nowhere at my left knee. “Well, thank you for taking the time to–” I began, looking down…but he had already vanished again. I turned around. My granola had vanished, too. So now you also know why it’s called what it’s called. I don’t blame him, though. It is darn good cinnamony, crisp, and unlike-anything-you’ve-ever-made-before-and-I-rarely-ever-say-this granola. 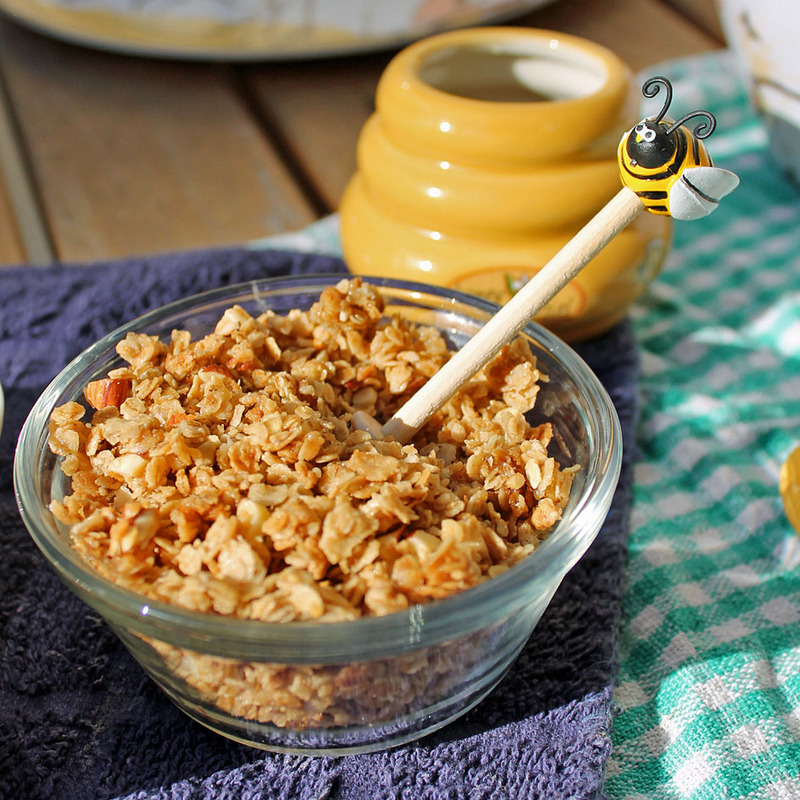 Think of picking out all the crunchy sweet granola clusters from Honey Bunches of Oats…only better. This post is part of the Lit, Wit, and an Oven Mitt (LWOM) series here at Wallflour Girl, where Ala takes a popular or classic literary character and uses him/her/it to tell a story about her recipes. Ala is an English literature graduate student with a strong interest in children’s literature, Victorian lit, and everything in between, beyond, bubbly, or burgundy. Ala does not own the rights to any of these characters or original literary texts, although she does own a really cute Winnie-the-Pooh balloon-shaped stuffed-animal. This series is intended to offer you a glimpse into her world through our shared love for food. Please let Ala know what you think of these stories–she’d love to hear what you think! Preheat oven to 300 degrees F. Lightly grease a 9×13-inch baking pan (or whatever large size baking pan you have available–enough to fit 6 cups of oats in an even layer no more than two inches thick). Pour oats and chopped nuts into prepared pan. Bake in preheated oven for 40-50 minutes (stirring every 15 minutes), or until toasted and a dark golden brown. Remove from oven and allow to cool completely in pan before crumbling. Store in an airtight container. That cartoon character irritated me when I was a kid 🙂 … Love your granola and will for sure try it. Looks so crunchy and yummy! haha! How funny–I think I was a bit irked as well, although Alice’s naivety bothered me too. This really is an awesome granola–thank you for stopping by, Muna! It’s great to see you. No need to persuade me this is the best granola ever. 😉 Fun post! But I gotta run, you see I’m late . . .
Oh man, I love this recipe! I am craving granola something fierce! I’m glad it suits you–I’ve definitely gone through 3 batches in one week. Thanks so much for stopping by! Thanks, Tanya! Rolled oats will work, but you will need to adjust baking time accordingly, since rolled oats are basically less processed versions of quick-cook and will take longer to cook through. I would recommend keeping the baking temperature the same and extending baking time by 7-8 minute intervals, until you achieve desired crispiness. I’d love to hear how it goes if you try it with rolled oats! Mine is just out of the oven and I’ve been nibbling at it as it cools. So good, I’ll be making this again and again!! This recipe is awesome (even after I practically butchered the implementation). I was going to half the recipe and then realized I was still short 1/4 cup of brown sugar and 2 cups of oats (Yikes! How did I miss that?). So I added an extra cup of almonds and about 1/2 cup of walnuts. I also used regular Quaker oats (don’t know if/how it’s different) and it still turned out great. This is a keeper! Carolyn, you are so sweet–how have we not officially met before?! (Unless the names are slipping under my radar and out of my mind–they tend to do that sometimes!) Thanks for sharing your changes–the coconut oil is definitely something I’d love to try. You’re 110% welcome, and thank you for your wonderful comment, it made my day! 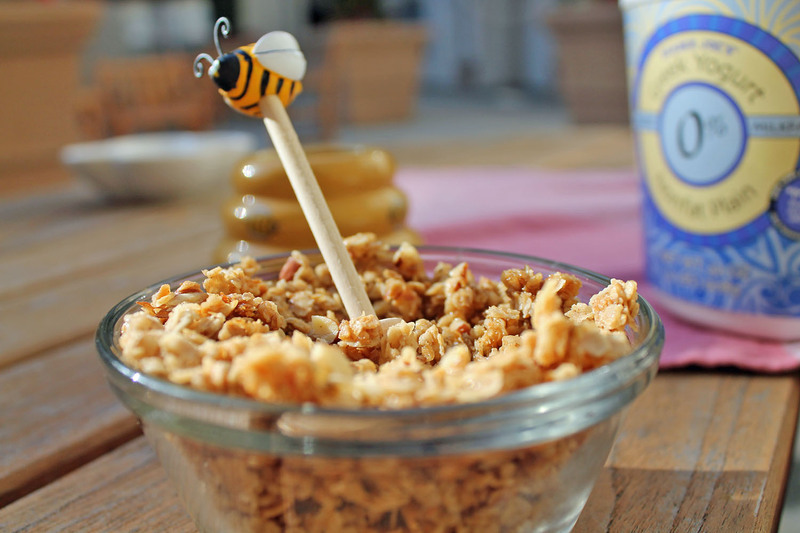 This is my favorite granola recipe so far! Very versatile. I add whatever I have…sunflower seeds, pepitas, almonds, mixed grain oats, steel cut oats, quick cook oats and regular oats and I cut the sugar down. I love all the different textures! Thank you so much for sharing! This granola recipe is PERFECT. PLEASE label it as VEGAN since it is and all the vegans of the world will find it. GREAT idea, Gail! 😉 I sometimes forget how delicious vegan treats can be (and that they’re even vegan! ).